This event has filled out. We look forward to seeing you on Friday, April 20th. This year’s honoree is JW Piccozzi, Inc. and they were chosen based on length of time in business, 25 years, membership in the Shelter Island Chamber of Commerce and a history of having promoted the Chamber by being an active member of the business community through financial contributions and/or volunteerism. Piccozzi's Gas Station has been providing gasoline to Shelter Island motor vehicles since 1927, and is America's oldest Mobil gas station. Piccozzi's also offers bike rentals and full marina services in the summer months. 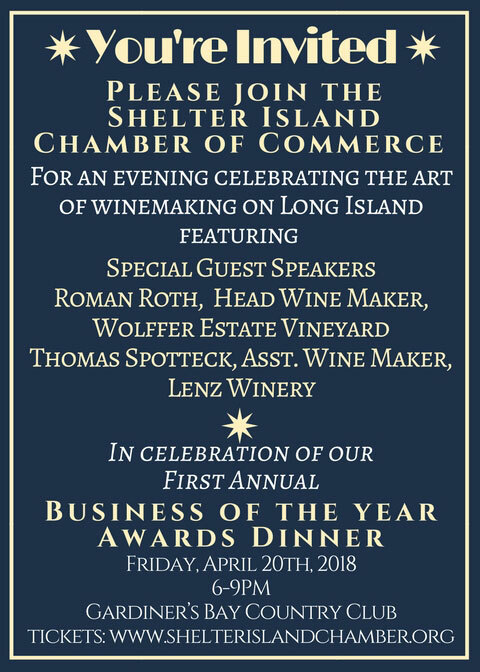 The Business of the Year Awards Dinner is not a fundraiser for the Chamber, as they simply wanted to honor and promote the businesses that contribute to the Shelter Island Community each year. for event updates, media placements, and local business profiles.